Going by recent ONS data, things are generally looking pretty good for the well-being of our children in the UK. The ONS have just released data examining the quality of life for children aged up to 15 years old in the UK. To judge this, a set of 31 indicators are used, ranging from objective questions about participation in sport, to subjective questions about happiness. The data in this report focus on relationships: in the family, with friends, and in the wider neighbourhood. 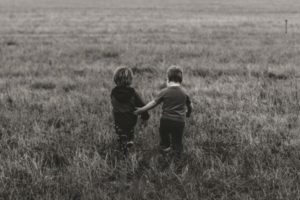 Such relationships are increasingly becoming an integral factor in a child’s quality of life, as the stability and healthiness of these relationships echo their circumstances and social interactions. As the report states, “Children’s well-being is an important part of the nation’s well-being.” And, from these figures, it would appear that children’s well-being is looking particularly promising. For instance, the figures state that children aged 10–15 who argue with their mother more than once a week fell from 31% to 26% between from 2009/2010 and 2015/2016. In the same time period, there has been a significant increase in the percentage of children who talk to their father about things that matter to them – rising from 38% to 45.2%. There seems to be less friction within families, and a more open dialogue between parent and child. Clearly, if family relationships are a robust indicator for children’s well-being, then children in the UK have a relatively good quality of life. However, UK children do not seem to have such robust relationships with their friends. Whilst the prevalence of loneliness among the elderly is something which we are unfortunately increasingly aware of, it is rarely discussed in the context of children. Some of the data from this report suggest that children may not be immune to feeling unhappy and isolated in social circles. The proportion of children who reported happiness with friends fell from 85.8% in 2015 to 80.5% in 2017, and the ONS suggests this is an indicator that young people are finding it difficult to manage good social relationships. Childline reflects this struggle – last year it received 4,000 calls from lonely children. Perhaps we can learn from the initiatives that are working so well with the older generations, and roll them out with younger people to combat the ill-effects of loneliness. It must be remembered that not all is as positive for UK children as the relationships data in this report would suggest. Just last week, we heard analysis from the Scottish government which estimates that by 2030, 1 in 3 children will be living in absolute poverty. Ministers’ responses to this data suggested that such shocking predictions are an outcome of cuts to welfare across the UK; and nowhere has this been more prevalent than in cuts to youth services. London’s youth services have seen an unprecedented decline in the last decade, with at least £39 million cut in the last seven years. And of course, we must not forget the regional disparities involved when discussing child poverty. Anne Longfield, the Children’s Commissioner for England, worries that children in North England face “the double whammy of entrenched deprivation and poor schools”. Indeed, children receiving free school meals in London are 40% more likely to get good GCSE results in Maths and English, compared to their contemporaries in Northern England. She worries that these children are being left behind, especially in the context of the pursuit for regeneration in the North – something which teenagers do not identify as being a benefit for them, rather just a few “shiny buildings” built for show. It would be interesting to see whether the ONS data captured any regional disparities – particularly among the indicator of how children feel about their local area. All too often we see children in the UK as a single cohort; it is easy to overlook the unique challenges children face depending on social background and location. Whilst the relationships experienced by children in the UK seem reflect a healthy, balanced population, it is clear that this is not all there is to a child’s quality of life. These data paint a rather rosy picture for the well-being of young people, and this must be celebrated. However, we should not let this good news distract us from the hardships facing young people across the country, whether it be loneliness or facing the realities of living in poverty. It seems that an easy place to start addressing these issues would be a reinvestment in youth services – not just as Sadiq Khan is doing in London, but nation-wide.